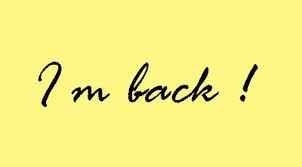 As the above suggests, I AM BACK! Here to bore you with my pointless ramblings once more. So, where have I been for a month? Nowhere. I have done nothing. Zilch. Nada. There is no excuse (oh, except for the part where I was sucked into a black whole at the bottom of my garden, thrown into a world dominated by fairies and made their queen. But that’s irrelevant…). I have quite simply been completely unable to type anything! With no idea what to write, or even how to begin, my blog has been deserted. I read a few books during my disappearing act – some good, some very good and some rather bad, oh, and I returned to work after SIX MONTHS – what a shock to the system that was! – but I plan now to devote my attentions once more to my blog. So here goes…. 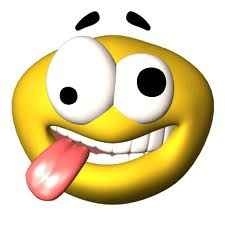 I have missed my blogging buddies – you know who you are: Kevin – Mr Trailer, Monsieur Hook, Lois, Groovyrick, Dtralser and many more of you, and i’ve missed the giggles others’ posts have given me. So…back to work. Back to the daily grind and the hour long commute on the train to London. Oh how I’ve missed it…. Because I’m on a ‘fazed return’ (a few hours each day – you know, to get back into the swing of things) I am travelling at different times of the day than I usually would. This means I am travelling with those that do not work, ie, screaming babies, loud, obnoxious groups of teenagers, arguing couples and noisy pensioners. Oh it’s so much fun. Honestly, I love it. But I guess that’s just me being lame, as usual, and it will all go back to normal eventually. Sooooo, I guess that’s enough crazy for one post. But fear not, I’m back, and here to stay, so of course more crazy will follow soon! I’m off to check on the fairies now – peace out!